Many of us are by now familiar with using LexisNexis to find news and legal resources. The LexisNexis interface that we’re used to is getting a face lift and a name change. In fact, it already has—Nexis Uni. Currently in the library’s list of popular databases, you will see both the classic and the new versions, but as of the end of 2018, the classic will disappear. If you are used to looking for cases in LexisNexis, the same task in Nexis Uni may take a little getting used to. As always, there is more than one way to use the database to find a case and the most obvious-seeming options can be a bit confusing at first. Looking at the main search page of Nexis Uni, you will see a Guided Search area with the question “What are you interested in?” This is tempting, especially as there is a Cases option planted squarely below. However, once you select that cases button, the next question is “State or Federal?” This may be an obstacle to a user who is not certain of the jurisdiction. So perhaps you go back to the main search page and this time see the “Get a Doc Assistance” link just below the search box. This is tempting, too, especially since, once selected, it seems to be all about cases. You can search by citation, party names or docket number. If you are well-versed in legal research, this may please you, as there are detailed options you can select to conduct a controlled search. The average user, however, will likely feel overwhelmed with the choices. The party names option looks promising but returns zero results unless you also select a jurisdiction. So, back to the home page. I can vouch for a more direct route to finding a case, especially if what you seek is a specific case for which you have at least one party name, or a case on a particular issue. In the main search box, type your search term (e.g. Griswold or Title IX), then in the dropdown box to the left of the search box (where it says “All Nexis Uni”) you can open that to choose Cases from a list, then select Search in the lower right of that same page. If your desired results do not appear early on in the list, you can enter a party name or a key word on the left side of the page to narrow the results. One other note to keep in mind. There is a prominently displayed “Export Citation” button at the top of each document. This takes you to a set of options for citation styles, but does not (yet?) connect with citation managers like RefWorks as classic LexisNexis did. I don’t mean to disparage Nexis Uni. It improves in several ways upon the classic, most notably in its clean appearance and the ability to run either natural language or Boolean searches. They will likely continue to make changes in coming months to address users’ needs. 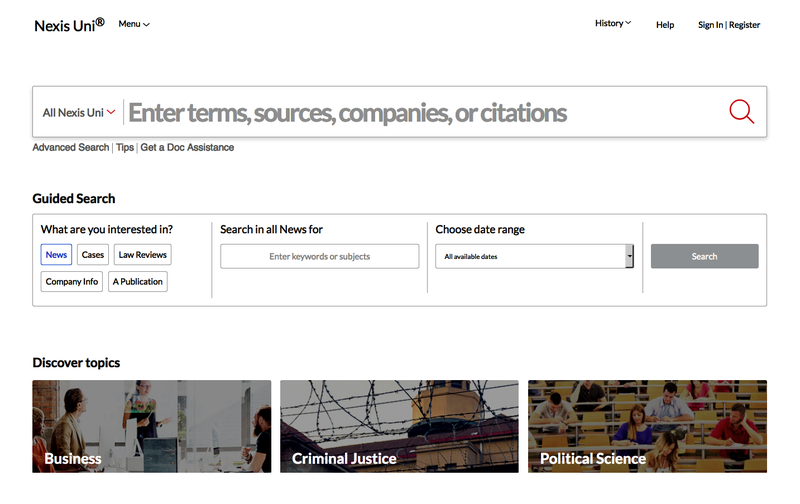 The Discover Topics link presented on the home page, which may be a replacement for the Hot Topics links in the classic version, can be a useful tool for generating topic ideas, via three broad categories: Business, Criminal Justice, and Political Science. To end on a positive note, Nexis Uni is still the excellent source for news and legal resources that it always has been—it’s just a matter of adjusting to new strategies to get to them.